Michael Debrah is my name from the Eastern Region of the republic of Ghana. 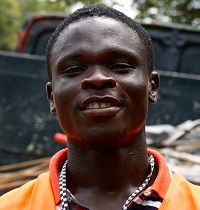 I am a product of Takoradi Polytechnic holding a higher national diploma (HND) in building technology. I had the opportunity to work for Sabre as a construction site manager in February 2015 after applying for the position which I read about on the net, I was fortunate to be called upon for an interview through which I was offered the position. My responsibility on Sabre’s construction site is to run an efficient site to ensure project delivery. This involves all aspects of site management, including people management, health and safety, stores management etc. Working with sabre is an opportunity for me to learn further and improve upon my career, especially in construction management and also to gain more knowledge in the sustainable concept of construction. It is also an advantage for me to tour the nation since the project occurs from one place to the other. I will like to make Sabre my home and work for Sabre throughout my working period. Fufu with hot palm nut soup, after an appetizer.